Hanoi is a beautiful city and has a lot of city parks. Cool air and different from Ho Chi Minh City who has more modern with tall buildings. Hanoi feels more relaxed too peaceful. The city is able to combine traditional beauty with modern comfort Vietnam perfectly. Prices of daily necessities are also very cheap in Hanoi. 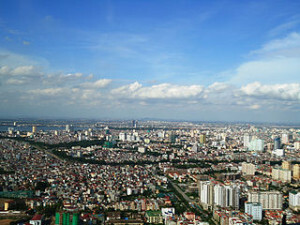 Hanoi is the capital of Vietnam, located in the northern part. It is causing the city has a tropical climate, but leads to a sub-tropical climate, With different cities in the south. As in the tropics, Hanoi generally have two seasons, rainy and dry seasons.But there is a transition month so the city can still experience the four seasons. Summer in Hanoi probably more like in southeast asia southern states, may be hotter but sometimes cooler. Average temperature in the summer that occurred between May and August is 32 degrees Celsius. Humidity level is high enough you will be able to make a sweat when walking around the city. Rainfall at this time is also quite high.When tourists to Hanoi in the summer, it helps to bring along anti-mosquito lotion. Autumn may be the most beautiful time to be immortalized by the camera. which are scattered give other shades, which of course you can not experience in other southeast asia country. In this season the air becomes cool and the humidity level decreases. Average temperature in the summer is 25 degrees Celsius. This season lasts only between September to November. Winter in Hanoi may not be the same as in Europe, but for travelers from tropical countries of course the temperature in the city is enough to make you shiver. Average temperature in winter is 17 degrees Celsius. At a certain moment, the temperature can be lowered to below 10 degrees Celsius. Ensure that travelers bring warm clothes and a thick jacket when visiting between December to February. January would be the height of winter. February to April is spring, where the weather is still quite cold ranges between 15 to 20 degrees Celsius. This season usually also characterized by relatively high humidity with high rainfall. When someone asks when the best time to visit a place, then the appropriate response is when there is a promo cheap tickets. As a backpacker, ticket prices would be vital to decide to go or not. However, it would be better if you come to a certain place to coincide with the festival. The best time to visit Hanoi is during Tet New Year. Tet Nguyen is Vietnam Lunar New Year, the new year marks the arrival of spring based on the lunar calendar.The calendar usually begins in late January or early February. Tet New Year is most important feast for the people of Vietnam.Such as Chinese New Year. On that day, the Vietnamese will cook special meals. They visit each other and congratulated the new year party. The children receive money from an adult. Many of them also visit the temple to pray. Tet lasts about three days. Various festivals are held to celebrate this important day. so if you are wondering when the best time to visit Hanoi, probably early spring is a great time. Travelers will enjoy a variety of cultural festivals in addition to see firsthand the practices of local people to welcome the holidays. In addition, spring is a good time because the weather is cool, while the sun was warm enough. Hanoi has many city parks look very beautiful in the spring. Like any big city in the world, the population of Hanoi was also increased significantly every year. Population growth can be seen from a blend of old buildings with modern buildings stand side by side.The population of the original Hanoi perhaps only a third of the total population of the Vietnamese city ibo this time. even in the Old Quarter which is inhabited by a population who become traders for generations, is now being occupied by the traders from other provinces. Many indigenous people who rent out the front of the house to be used as a shop, and they remained at the back of the store.